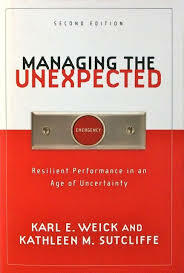 The first edition of Managing the Unexpected was published in 2001, Reason's first book Human Error goes back to 1990. I wonder sometimes: what to make of the reality that a few of us read the research and try to draw correlations to actual practice, but most of our nuclear industry colleagues go forward as if much of this literature didn't exist at all? Just now there is a slide deck from Commissioner Apostolakis (http://ansct.files.wordpress.com/2013/03/20130430-presentation-apostolakis-ans-ne.pdf) that is the report of the internal NRC Task Force that he supervised on the regulatory framework of the future. It is difficult to see how these two schools of thought even occupy the same planet. We've got to be missing something about how these substantial but distinctively alternative (complex, high-consequence) world views manage to co-exist and yet have so little evident influence upon one another. I was just reading a 2009 paper by Leveson and friends at MIT taking both Perrow and Weick, et. al. to the woodshed for having incomplete perspectives. But the reality is that if these differences of models or methods are getting aired out where practitioners might make some use of them I'm not aware of at what venues those exchanges are happening. At least the economists blog & flog each other out in the open - less so it seems the Safety Management experts. Perhaps we're (well the rest of you all anyway) all too polite?